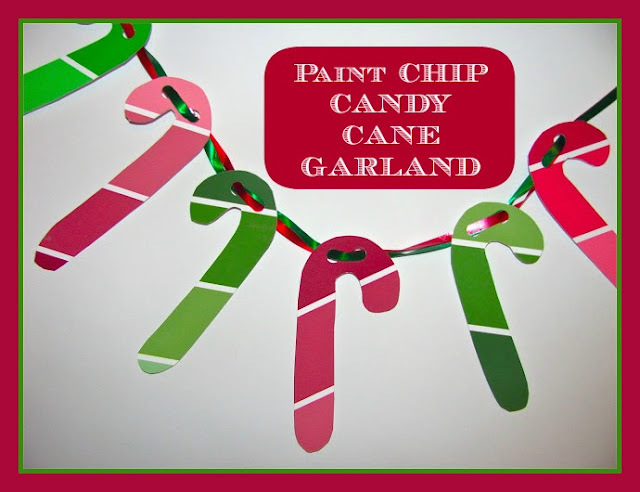 The Chocolate Muffin Tree: Paint Chip Candy Cane Garland!!! We've done quite a few posts on paint chip art, but when I saw Paint Cut Paste's post on Paint Chip Christmas Trees it got me thinking for a while about another idea! Paint chip Candy Cane Garland and ornaments!!! It was definitely an "AHA" moment for me! Take a look. 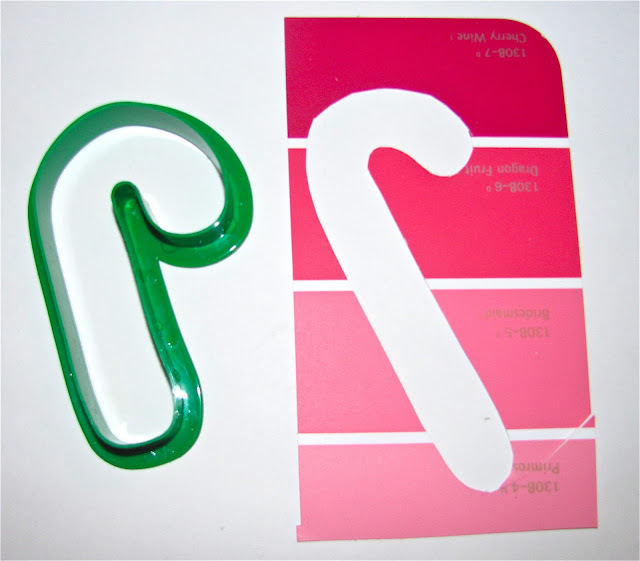 I had a bunch of paint chip samples on hand and just happened to have red and green shades! So happy! I know there are other colors of candy canes, but I just wanted to stick with the traditional colors! 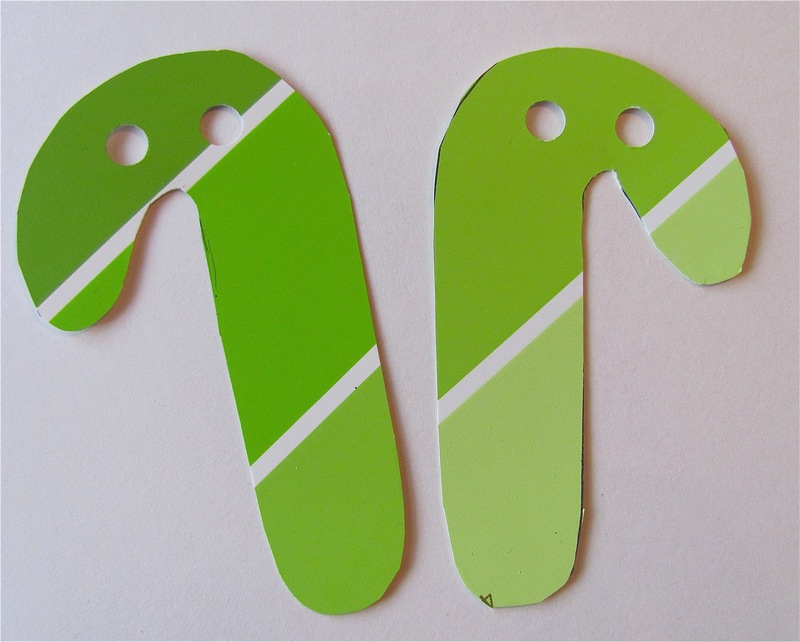 You can either free draw the candy cane on the back of the paint chip or use a cookie cutter as a pattern for a more uniform result! I made the candy canes slanted so the white stripes would run diagonally. After I traced the candy canes, I cut them out and punched two holes on the top. Then I strung a red and green ribbon through the holes. I made sure the red ribbon showed through on the green candy cane and vice versa! I just love the results!!! If you are worried about the back showing on the candy canes, trace two candy canes back to back and glue together. Then the garland will look pretty from both sides! You could also make ornaments with the candy canes or whatever you choose to make with them! Cassie even made her own Colorful Paint Chip Candy Cane Garland!!! Be sure to check out Paint Cut Paste's Paint Chip Christmas Trees here. Dilly Dali Art has a great post on a Paint Chip Christmas Chain here. Paint Chip Collage and Easter Egg. I also think this is such a good, creative idea! This is indeed a genius idea! Turned out gorgeous. Love the hues in each and the white lines going across the colours! Lovely. Pinning it right away and sharing on FB...! So cute! I need to start collecting paint chips now to have a collection for next year's Christmas! thanks for the mention! i love your candy cane twist! I love this! I pinned it! these turned out way cute! LOVE them! Another great idea for paint chips! Great idea great for a christmas party!!!!!!! !